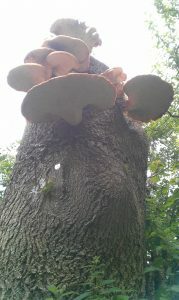 Common name: Dryad’s saddle, Scaly polypore, Pheasant Back Mushroom, Hawks Wing mushroom . Words and Photo’s By Adrian, a Pembrokeshire Tree Surgeon of Arb-Aid. Type of decay: White rot. This annual bracket appears at two times of the year, May-June. 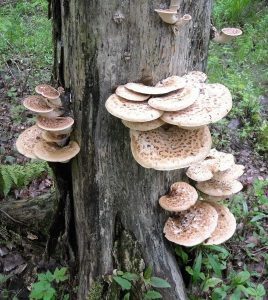 The fruiting body can grow up to 50cm across into a large fan shaped bracket with a short tough black-brown stem. 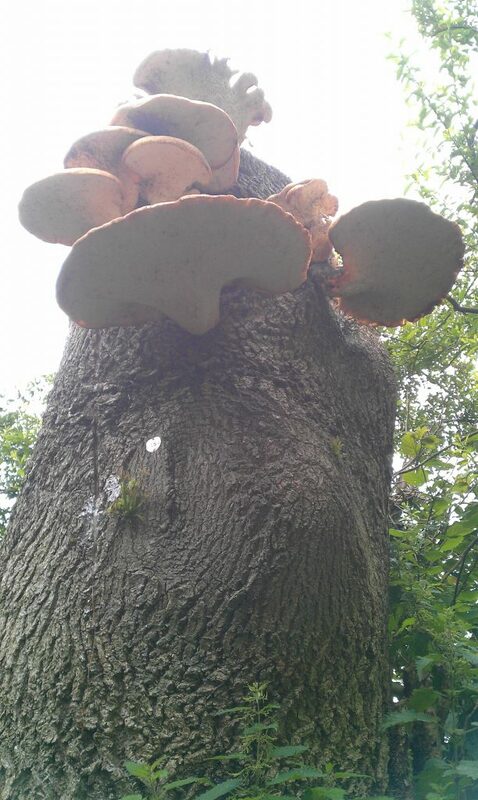 The underside of the bracket is pale yellow with large pores in a honeycomb formation. The surface of the bracket begins pale cream-white with small brown scales in a ring formation. With age the surface becomes browner in colour with more scales. The brackets can grow singularly or in clusters that overlap. The spore powder is white. The bracket grows at the base and higher up the stem and often on thicker branches or pruning wounds. Old fruiting bodies are a shrivaled black mess from August onwards. Causes white heart rot to the stem and branches. Sometimes the wood at first becomes brittle and then soft forming cavities in the stem and branches. The result of the rot is brittle and ductile fractures. Most common broadleaf species can be affected by Polyporus squamosus but it is most commonly found on Sycamore, Beech, Elm and Ash. These have been called just edible by some and poor by others. They can be quite good though. However, they need to be young, the pore layer needs to be very thin (1/16 in. or less is likely to be good), and most importantly your knife needs to be able to pass through it very easily. Whatever the knife cuts easily is likely to be good. Sometimes just the outer edges are usable but nice tender ones can be found. They are best cooked straightaway. Like many other wild mushrooms the aroma is ephemeral often disappearing within hours. Tempura frying will retain some of this “watermelon” character. Sautéing or pan frying is a good way too. Slice them thin and cook them hard and fast. Overcooking will create toughness.